Extremely well-known within Scandinavia, Lena Cronqvist remains virtually unknown elsewhere. The massive retrospective of over 100 paintings and numerous drawings selected from work done between 1964 and 1994 accorded to her this fall testifies to the esteem in which she is held in her own country. 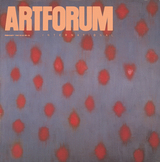 Order the PRINT EDITION of the February 1995 issue for $17 or the ONLINE EDITION for $5.99.